"It can get tedious sometimes, going through story after barely-distinguishable story, largely registering a resounding “meh” on the wunder scale. Then, finally, comes a piece that makes it worthwhile, that sends a galvanic tingle through my story receptors and makes me sit up straight in front of the screen." "I think this is the best thing that Al Reynolds has written since Revelation Space. Ostensibly a hard science-fiction story about bird-watching, “A Murmuration” is also a study of professional obsession, isolation and creeping madness." Lois Tilton hasn't always liked my stuff, and Jonathan is a hard man to impress, so I'm doubly pleased with these kind responses. Incidentally, "A Murmuration" is the second story of mine to be partly inspired by personal experiences of the peer review process in scientific publishing. Here's the other one. Today's post brought two handsome copies of Interzone 257, which contains my new story for the magazine. See earlier post for a short excerpt from the story. It's always a pleasure to be back in Interzone. Not only was the magazine instrumental in getting my career off the ground, by publishing my first stories and helping foster the professional contacts that eventually led to a novel deal, it had an immeasurable impact on the state of British science fiction. 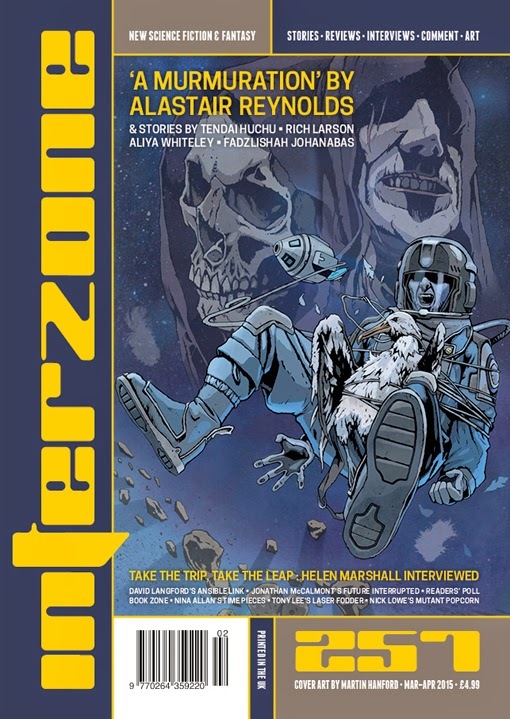 Interzone launched many new writers, but more than that it brought a vital centre back to the field, reigniting a conversation (sometimes fractious, but always interesting) that had all but faded since the demise of New Worlds. I still think Interzone is one of the best places to get a sense of where science fiction is at, and where it's headed. Or you can find it in newsagents and specialist SF bookshops. Go on, give it a try.